2 How Should a Suit Fit? There are endless ways to combine a shirt and tie with a black suit. The black suit is safe; you can hardly go wrong dressing up on a black suit. It’s no wonder then how it has become one of the most prominent dresses in a man’s wardrobe. Dressing formally doesn’t have to be a daunting task, follow this guide to rediscover the most stylish ways of paring up a dress shirt and tie with a black suit. Black suits can easily make a fair skinned individual look pale, contrast and blend the suit with warmer colors. Dark skinned individuals can experiment with bolder color combinations with a black suit. Black is a universal color, the most common of all colors, the most versatile. Its common knowledge that black goes with everything and it’s quite impossible to mess up. When you are pairing a black suit you have to put into consideration what colors pair well with black as well as your complexion. Avoid looking like you borrowed the suit. Proportions are key here, have your black suit tailored by a professional tailor. It must fit in or else you risk appearing sloppy, get the sleeves and trousers hemmed out in case they appear too short or too long. Outside your very regular white shirt and black suit combination, some colored shirts do very well with black suits. A very good example is a Redshirt, red compliments black perfectly and can be used with a black tie to kill off the look. Other colored shirts include a vibrant navy shirt and the very popular blue shirt in various shades. Try to use these colors moderately ensuring that the prevailing color is still the black suit. The suit should serve as some form of foundational color onto which other colors are built on. Avoid colored shirts that are overly expressive, too bold and that draw too much attention away from the black suit to the colored shirt. Having said that, experiment with grey and light silver, turquoise and a mild shade of yellow. Without out dressing the groom, weddings are a perfect opportunity to dress up with a colored shirt. Colored shirt options have the advantage of helping you avoid the monotonous look of a white shirt and black suit. Everybody else rocks that combination, stay ahead of the pack by looking a little bit different. Job interviews and office day wear are great occasions to pair a stylish colored shirt with your black suit. Printed shirts with a black suit are not as popular as it should be probably because of the fear of appearing overly dressed and out of place. If only you knew how to dress this up properly they can help tone things down a little. Printed shirts can help attenuate your personality and style. The trick to pulling this off is to try not to go overboard with it. Stripes or regularly patterned polka dots do wonders to a black suit. They are just between casual and very formal and can help transit your attire from a formal to semi-formal wear. Black suits have a way of watering down the regularly printed designs to something that is easy on the eyes and charming. Printed shirts under suits will work well on a date, a night out or for graduation ceremonies where your personality or individuality is key. We won’t recommend prints for office wears or highly formal occasions, opt for stylish plain colors to keep things formal. While this can easily be pulled off you can still spice things up by wearing all black with different textures and fabric materials. Black on black is a very formal combination and should only be reserved for formal occasions. Slightly paring with a tie of a different shade can help reduce the monotonous effect of color blocking with black. Add an off-white dress shirt to add a little shimmer to your black on black outfit combination. VERSATILE OCCASION-It's suitable for multi-occasions,like wedding, daily life, business meeting, any fashion forward parties, any grandly holiday and ect. It is also prefect for the young men prepare for the Homingcming and back to school. SPEND LESS. There's no need to drop hundreds of dollars on a good looking, long-lasting, comfortable suit. Very affordably priced but not cheaply made, this suit is a great choice for anyone looking to dress to impress. It looks just as good if not better than much more expensive suits. DRESS WITH CONFIDENCE. There is nothing as cool, as confident, and as indicative of sophisticated style as a classic black suit. Perfect for work, for social gatherings, and for events that require proper attire, this suit could become a staple of any man's wardrobe. EMBRACE TRADITIONAL STYLE. 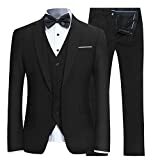 The single breasted jacket features a notch lapel, full lining, and a two button front for a very clean, classic look, which is carried forward by the matching pair of single-pleated dress pants. The suit is also double vented, a feature often seen in custom and higher end men's suits. FEEL COMFORTABLE. Made from quality fabric, both the jacket and pants are wonderfully soft to the touch and feel really great to wear. The double vented jacket adds mobility and gives the suit a long streamlined look. FIND YOUR FIT. Please note that the pants have a 6" drop, meaning that a size 42R suit, for example, will come with a size 36 pair of pants. Also note that the pants are shipped unhemmed to ensure a proper fit for your height. There are a wide variety of options to choose from when it comes to pairing a shirt with a black suit. Find the most common color combinations as well as pictorial examples of how to pull it off. The most popular of all combination, for those who want to play safe and keep things simple, the regular white on black is a staple color combination for formal occasions. You are sure going to look sharp and polished with a white shirt on a black suit but the only drawback is that it’s too common. Spice things up by experimenting with different colors of tie to find what will match appropriately. If the occasion demands, you can opt for different bold color trousers (not black), think carton brown, cream or darker shades of Navy. The next most popular bold color shirt combination with a black suit is a blue shirt. To pull this off, pair with a black tie and you are good to go. There are fashion enthusiast who would argue that a black suit should not be paired with a Navy or blue shirt but my 2 cents opinion has always been if it looks good then rock it. Break the rules, as long as it fits properly and you look good on it, by all means, rock it. Ideal for office wear a light blue shirt combined with a black suit and tie can work wonders all day long. Grey can be great to pair with a black suit, it’s been done endless times by real gents around the world. If you’d prefer to avoid the sharp contrast between a black suit on a white shirt then you can use Grey or its close counterpart silver to give you a subtle touch of light. Red is very bold and a daring color. Red pairs well with anything black. Red fashion sneakers on black jeans, red shirts on black trousers, just name it. Red fits black properly, but most people aren’t comfortable with red probably because it draws too much attention to its color. One rule tho, stay clear from flashy red like scarlet, they can cheapen the look of your outfit combination. Lastly, make sure you keep it stylish and smart. If you are not comfortable with red color, just avoid it totally, there is nothing as damaging as an unconfident self. Pairing a black suit with the right tie is as important as paring a black suit with the right shirt. Get this aspect wrong and you risk appearing sloppy and damaging your dress repertoire. Continue reading to discover dress samples of pairing different colors of ties with a black suit. The very formal black suit, black tie, white shirt combination is still as timeless as it was in the 80’s. Very popular in wedding ceremonies, burial, among celebrities and with bankers. Just as you will find in most movies, there is nothing more polished and sophisticated than a man wearing a tailored black suit, white shirt, and black tie. If you are just starting out wearing formal clothes, this should be your intro suit combo. Why? Because it’s safe and very easy to pull off. When you get more comfortable you can branch out into other suit combination. Although red matches black, combining a red tie with a black suit can be a little tricky. The background shirt you use is important. How does a red tie look on say a white inner dress shirt or a blue or navy shirt? Your guess is as good as mine. As with combining a red shirt with a black suit, avoid flashy shades of red like a scarlet red tie rather opt for textured bold colored ties. Going all black can be quite tricky to pull off. Unless you are fashion savvy you risk appearing dull with this monotonous looking outfit. I have found that using black in different shades can work wonders. 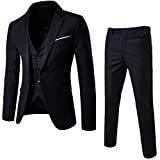 A silk black dress shirt, for example, can be the difference between a great looking all black suit outfit and a dull monotonous looking outfit. Combine with an ankle length dark suede Chelsea boot to finish off the look. Wearing shirts with a black suit shouldn’t be new to you but what might be alienated from your dress code could be those bolder colors and pattern we spoke about. Now might just be the time to try out those printed floral dress shirts. You don’t need to wait till an event is at hand to buy dress shirts, suits and ties to match, plan ahead and be well prepared to avoid the mistakes that come with last-minute shopping on impulse.